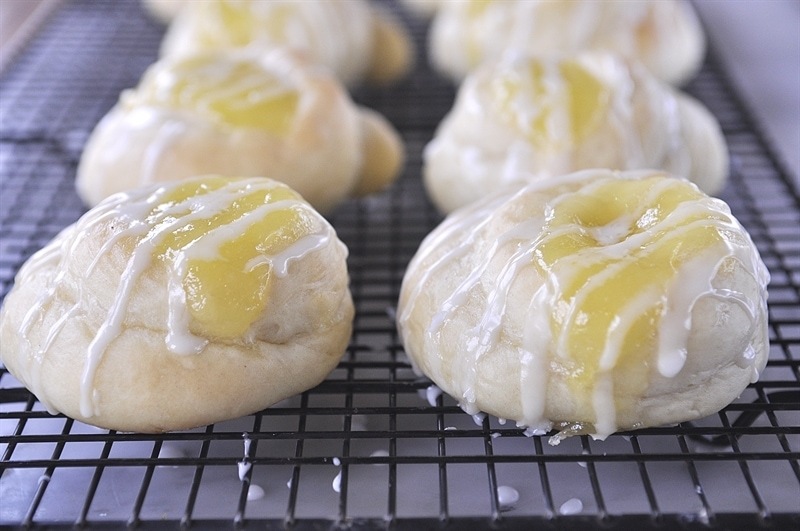 These lovely lemon rolls are full of lemon curd and drizzled with lemon glaze. This post is sponsored on behalf of ACH brands but all opinions are my own. You don’t need to pull my leg to share more lemon recipes in fact by the time I’m done, you might be yelling NO MORE LEMON! But I hope not. 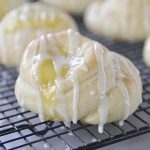 Today I’ve got another yummy lemon roll for you but this one is filled with that sunshine on a spoon I shared a few weeks ago, yes, lemon curd! I look for pretty much any excuse I can to use lemon curd in whatever I making or baking. 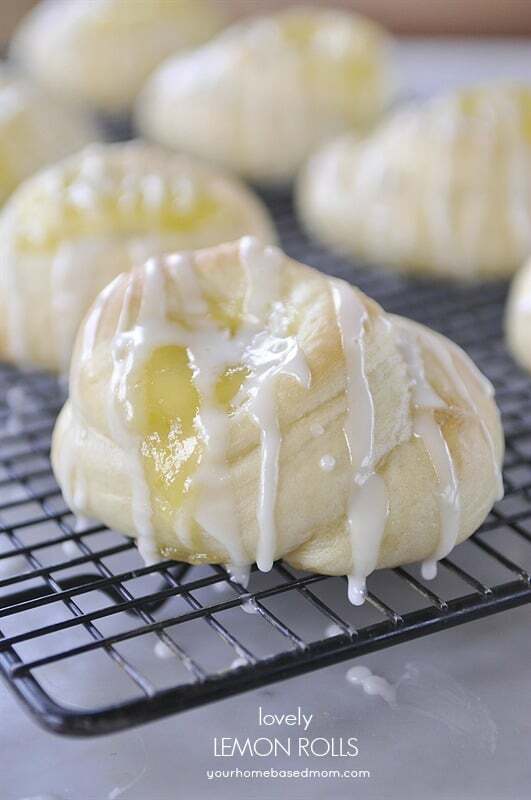 I am thinking these lovely lemon rolls would make the perfect addition to any Easter dinner or brunch you might be hosting this year. The tart, bright flavor is a yummy taste of spring. 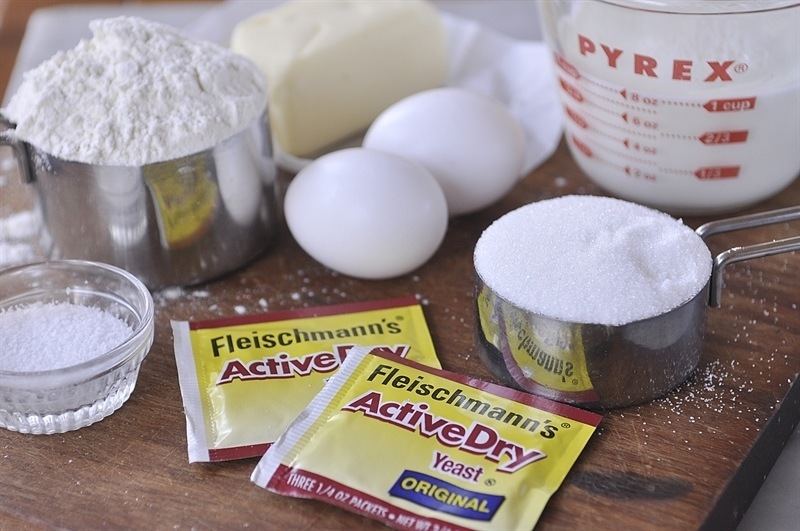 This recipe uses yeast, but don’t let that intimidate you! 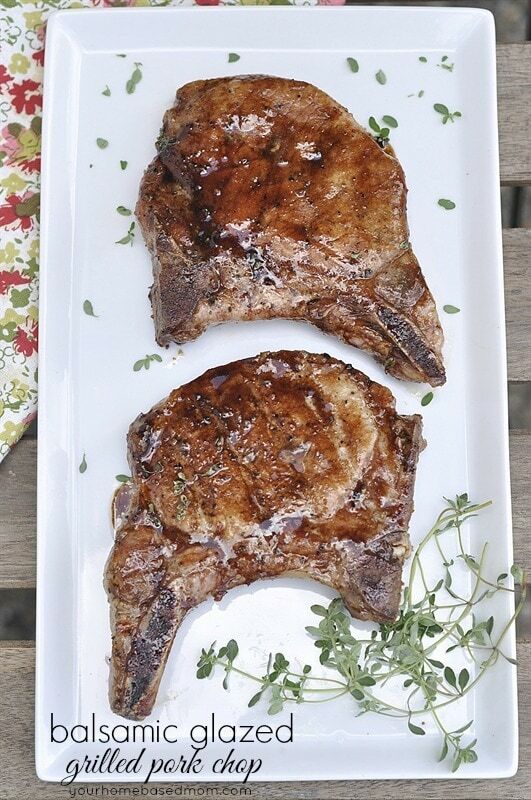 Using Fleischmann’s® ActiveDry™ Yeast makes them light and delicious. The trick to working with yeast is getting your water temperature right, you want it warm, not hot. About 105 – 120 degrees is perfect. I just test it on the inside of my wrist like you would a baby bottle. After you add the yeast into the water you just have to let it “proof” for about 5 minutes or so. You want it to look like this. 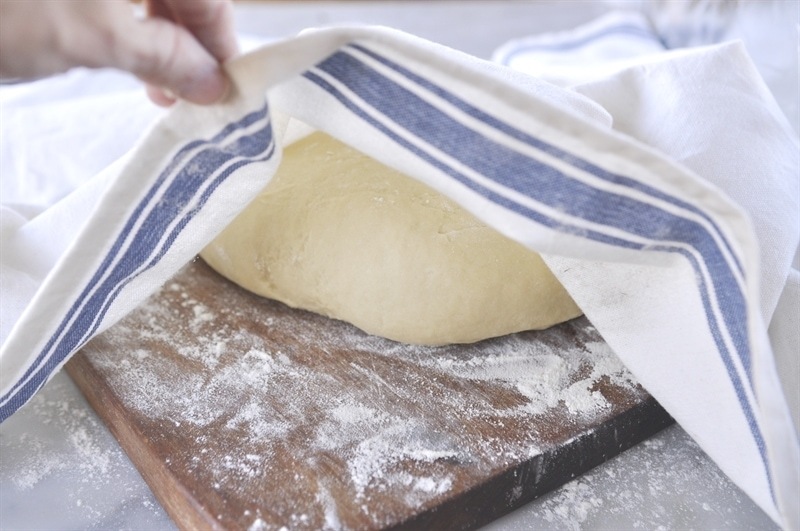 After you’ve got all your ingredients mixed together, you get to knead the dough. Now this can be done in your mixer with a dough hook or by hand. If you’ve had a frustrating day you may go for the by hand method. Work out all those frustrations on the dough. Just knead until it is smooth and elastic. Then you cover it and let it sit and rise. You want the dough to double in size. It will take about an hour. 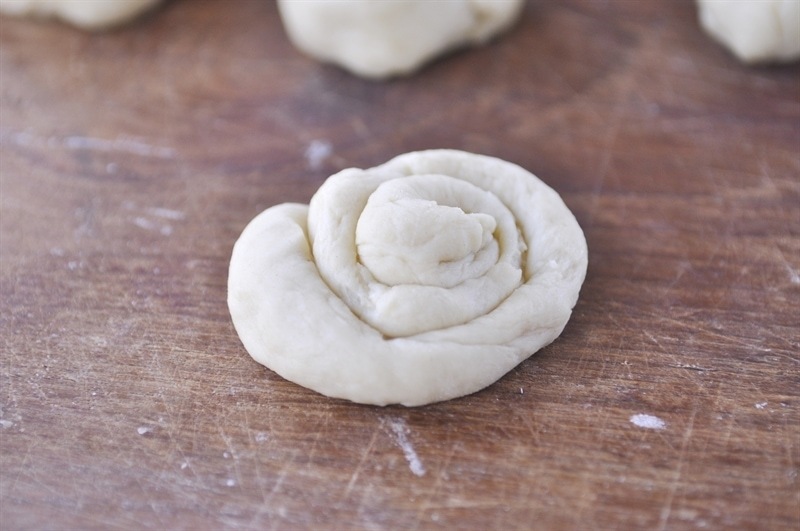 After it has doubled in size, divide the dough into 24 even pieces, or as even as possible. Roll each piece into a 15 inch rope and then form your roll so it looks like this. Just tuck your end underneath. Place them on a greased cookie sheet, give them a nice little layer of melted butter, cover them again and let them rise one more time for about 20-30 minutes. 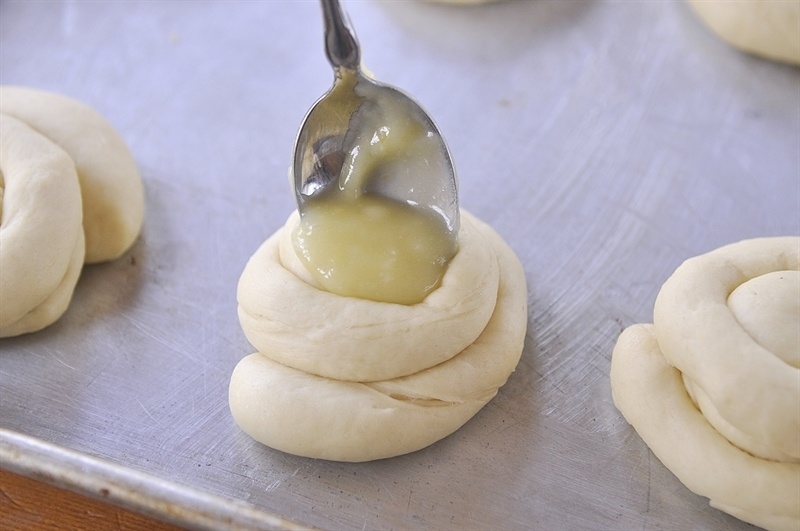 Before baking use your thumb to form an indentation in the middle of the dough and fill it with lemon curd. The bigger the indentation the better as far as I’m concerned. Let them bake at 350 degrees for about 12-15 minutes. Give them another layer of melted butter and allow to cool. 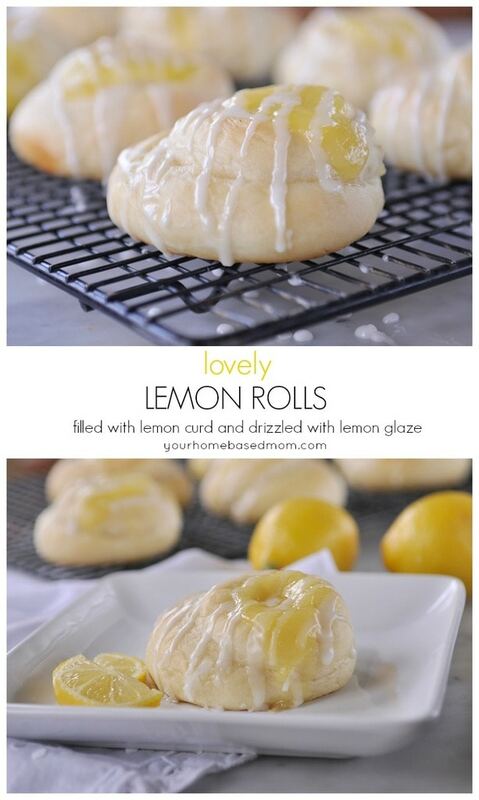 Then add some extra lemony goodness with a drizzle of lemon glaze. The more drizzle the better as far as I’m concerned. Place on a pretty plate and serve! 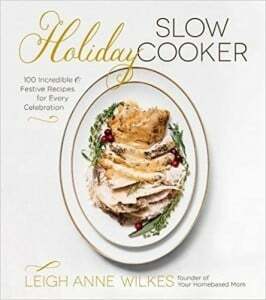 Combine warm water and 1 teaspoon sugar in a large mixing bowl. Add yeast; let stand until foamy, about 5 minutes. Heat milk and butter to 100 degrees to 110 degrees F. (Butter does not need to melt). Add milk mixture, eggs, sugar, salt and 2 cups flour to yeast mixture. Beat 3 minutes with electric mixer. 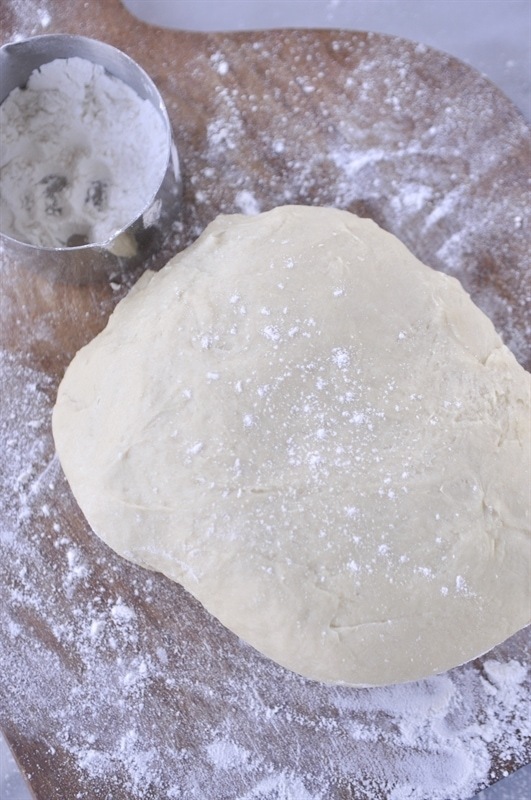 Stir in enough remaining flour to make a soft dough. Knead on lightly floured surface until smooth and elastic, about 8 to 10 minutes or use a dough hook in mixer. 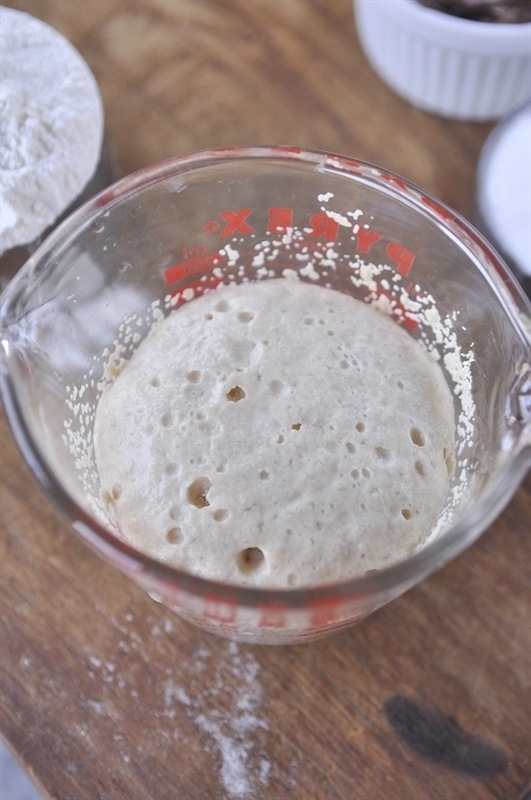 Place dough in a greased bowl, turning to coat and cover or allow to rise, covered on the counter. Let rise in a warm, draft-free place until doubled, about an hour. Punch dough down. Divide into 24 small balls. 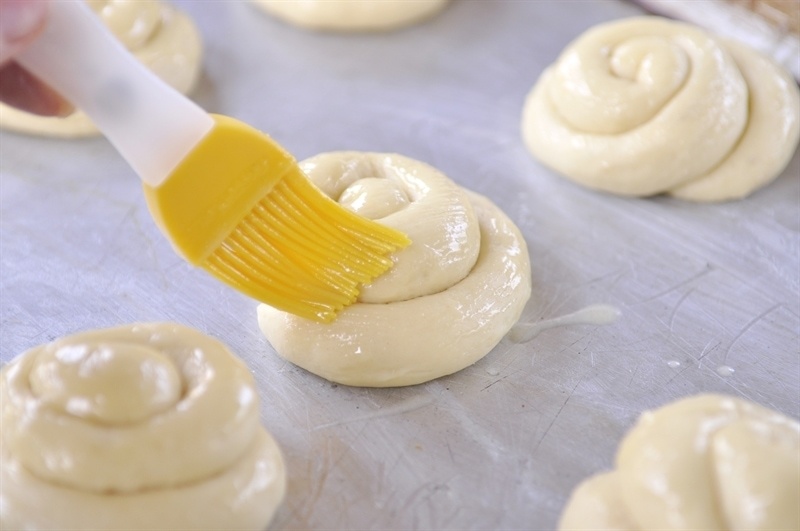 Uncover dough and carefully brush rolls with half of the melted butter. 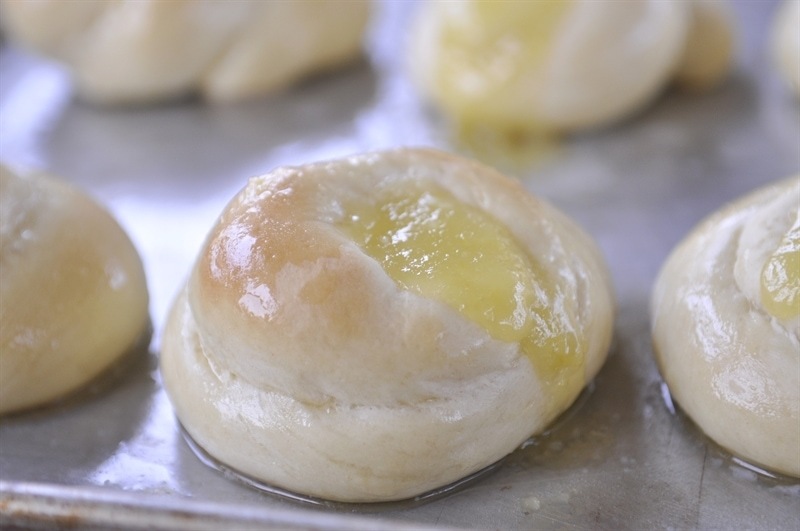 Make deep thumbprints in center of each roll; fill each with 1 teaspoon lemon curd. Bake for 12-15 minutes or until golden brown. Immediately remove from pan; brush a second time with remaining butter. Cool slightly on wire rack. In a small bowl, blend powdered sugar and enough lemon juice for vanilla desired drizzling consistency. Drizzle over warm rolls. Thanks so much – pretty and delicious! These looks so good. 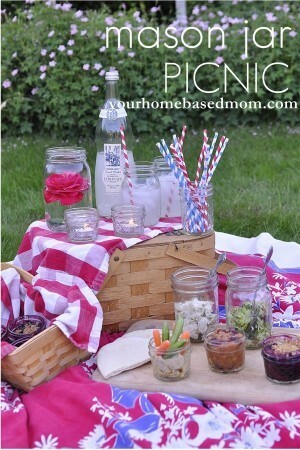 Trying you recipe FOR SURE… Pinning! Desiree, enjoy! It is fun to substitute different flavor jams in them. 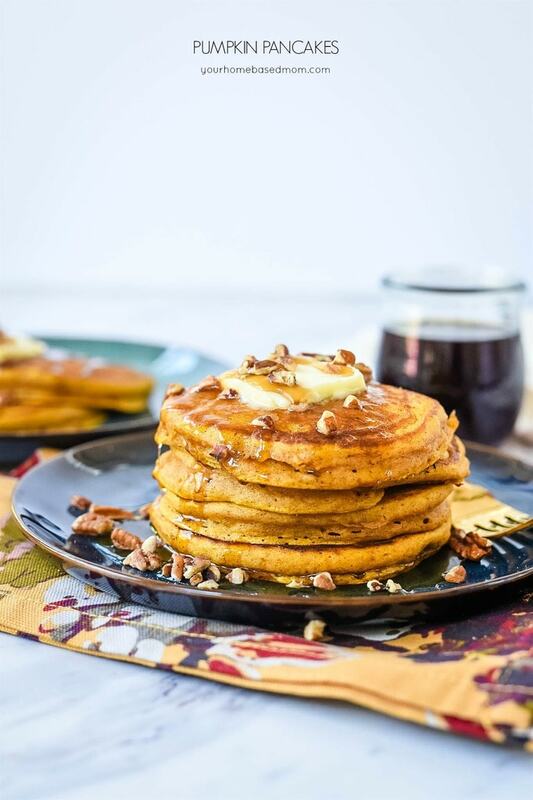 These look divine!! Must save this recipe:) Thank you! I’m with you – bring on the lemon!!! These look to die for. Yum!! Lovely, indeed. 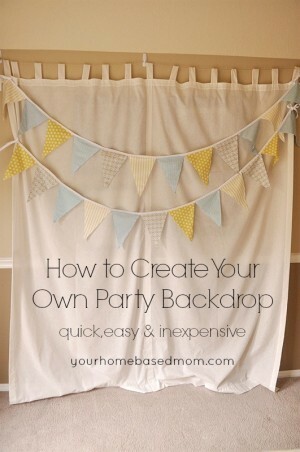 So perfect for Easter and any spring gatherings! 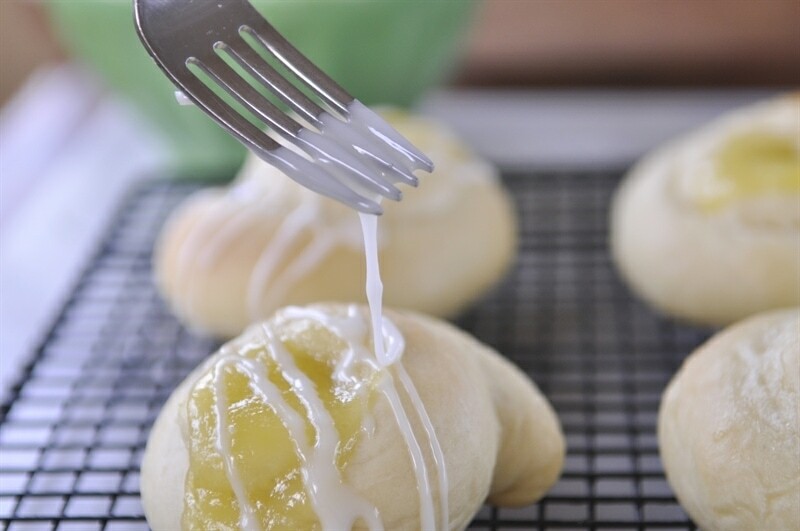 The photos are so good… somehow I feel like I should almost be able to smell them baking! Thank you for sharing with all of us so often! 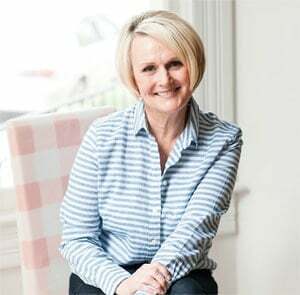 I love your recipes and I follow you for your creative Gluten Free recipes. 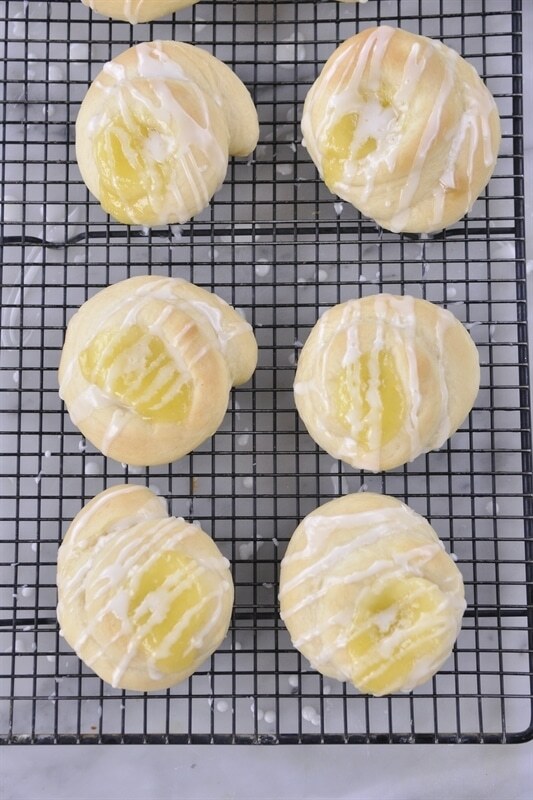 Is there any way to make these wonderful puffs of flour Gluten Free? Thank you. I have not made them gluten free yet. I haven’t found a gluten free yeast bread recipe I totally love yet. i also am excited to make the lemon curd. I made it as a teenager in school in England. Over there you can buy it in any store. Not so here :(. I love anything lemon. 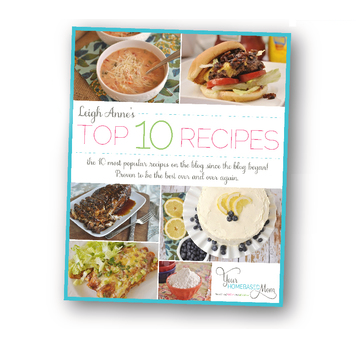 I usually give all your recipes a try and haven’t been disappointed yet! I would also love to hear about a gluten free version for my mother in law if you come up with a good one! Hope you love the recipe too!! This looks so good, yum! Thanks! They taste so yummy too. What is lemon curd? Can I use lemon pie filling? Lemon pie filling is not the same as lemon curd. There is a link to a lemon curd recipe in the post. I think lemon curd is so much better. This looks amazing..just wondering , as I hate making the dough…do you think using frozen bread dough, thawed would be ok?? Carol, It should work fine. Enjoy! Hi! These look amazing! Do you think it would work to try putting lemon zest in the dough as well? Thanks, love your blog! Think it sounds like a great idea – the more lemon the better as far as I’m concerned. i made these last weekend and will be making them for Easter a Brunch. Great recipe!! I love the lemon curd recipe it’s my first time making lemon curd and it was easy and turned out perfect. I like the sweet dough recipe as well, I’m comfortable making bread from scratch so this was a wonderful recipe, it was familiar yet new. I enjoyed making them and eating them. Marie, So glad you loved them too. Everything tastes better with lemon curd. Just made these for the first time. I am a ‘well seasoned’ baker and will give you my opinion. They look great, but….i think you should specify what kind of butter to use, as I would highly recommend using UNsalted butter. They were very salty, as i used regular butter. Other than that, they were pretty good. I did half with lemon curd, and half with homemade chocolate hazelnut spread. Also, I made 16 according to your directions, and the remaining 8, I made them into 16 instead (mini ones). I think the mini ones are more of a “one serving” portion. Should these be eaten same day, or do they keep well for a couple of days?